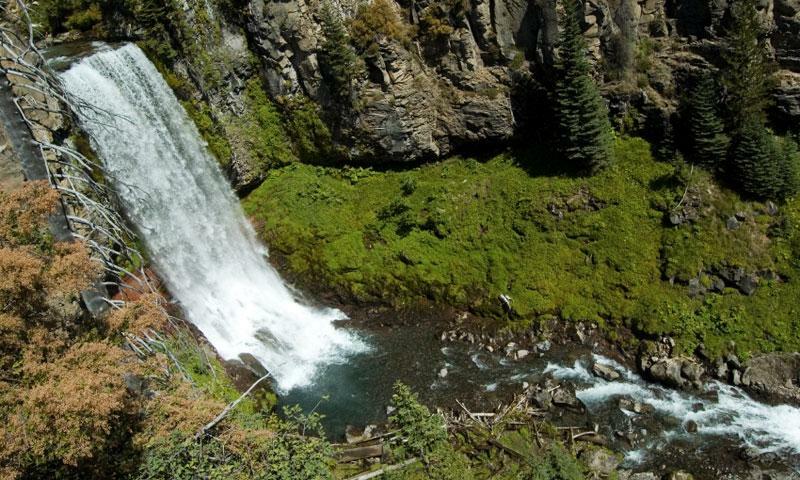 Nature lovers will appreciate Tumalo Falls - a spectacular 97 foot glacial waterfall deep in the Deschutes National Forest, just 14 miles west of Bend. Located only 14 miles west of Bend via a forest service road. Sparkling glacial waters cascade 97 feet into Tumalo Creek below. A variety of scenic trails perfect for hiking, trail running, or mountain biking. Nordic skiing on nearby groomed trails and back country landscape is a popular winter activity. The beautiful glacial waters of Tumalo Falls, tucked deep in the Deschutes National Forest, cascade 97 feet between two rugged rocky cliffs into the crystal clear waters of Tumalo Creek below. Tumalo Falls, Oregon, is surrounded by breathtaking scenery and attracts many visitors during the summer and early fall. Nature lovers will especially enjoy hiking along Tumalo Creek, which has several smaller waterfalls in the 10 to 30 foot range. Tumalo Falls, OR, is located about 14 miles west of Bend. To get there, go west on F.S. Rd. 4601 for 11.6 miles, then west on F.S. Rd. 4603 for 2.6 miles. During the winter the road is closed. Hiking and Trail Running – Tumalo Falls, Bend, has a variety of scenic trails nearby that are perfect for hiking or trail running. A 7.6 mile single track trail that follows Tumalo Creek through towering pines leads to a breathtaking view of the falls. Mountain Biking – There are several miles of scenic trails near Tumalo Falls that are open to mountain bikers. Skiing – Nordic skiers will especially appreciate the miles of groomed trails in the area, as well as endless acres of skiable back country. The sparkling waters of Tumalo Creek empty into the Deschutes River not far from Bend. Tumalo Falls has an elevation of nearly 5,100 feet. The word Tumalo is an Indian word. The meaning is uncertain, but “icy water” and “wild plums” are two possible translations.